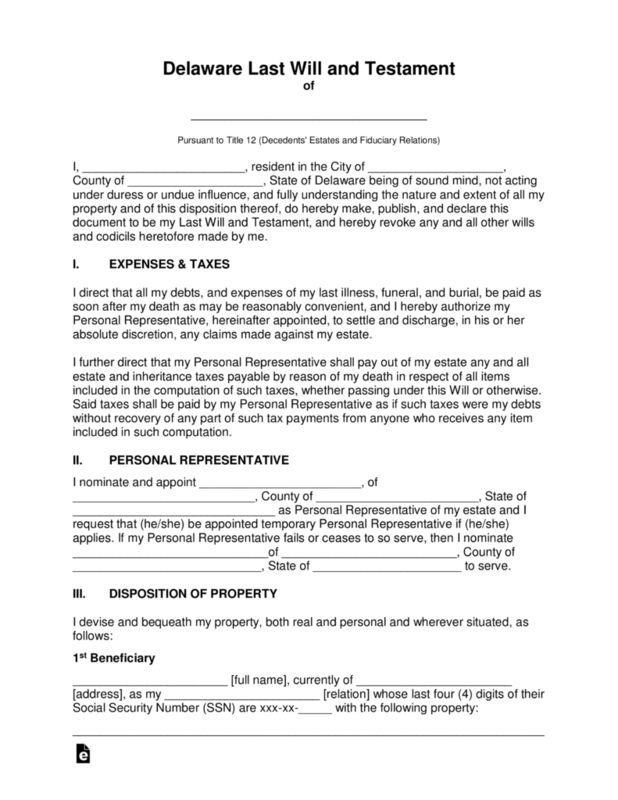 The Delaware Last Will and Testament is a document that would be set forth by the testator, to ensure their estate is distributed according to their own wishes and not the wishes of the courts. In the state of Delaware, laws regarding the documents are created within the Delaware State Code. In order for this document to be recognized as valid in the state of Delaware, the document does not necessarily need to be executed in the state. The document also does not require that the testator have assets that are only located in the state of Delaware. Delaware law only requires that the document, in order to be valid, must have been valid according to the laws of the location (state) in which it was originally executed or in the state in which the testator held residence at the time of death. 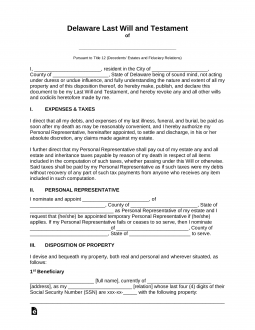 This document will require the signature of two witnesses and a notary public. Common Questions – A guide to writing a will and the probate process. Signing (DE Title 12, Chapter 2 § 201 & 202) – Two (2) or more credible Witnesses.